never going back to class. dancing with the cadence of the chants. for the son of a surgeon. high above the ground forever. and did not believe in belief. SUBWAY BY JOSH SAPAN, ISLE DE FRANCE BY MARI CASEY, TO ELECT A FISH BY ORSON SMITH, ANNIE FINDS A WAY BY HELEN REED LEHMAN, GLOBAL DREAMERS BY DIANE SAHMS-GUARNIERI, COLLECT CALL BY ELIZABETH CHRISTIE, VISITING HOURS BY ROBYN WEAVER, NIKOLINA BY SANDRA SHAPIRO. I’m the youngest child in a family of twelve in an Irish Catholic family. It was a good day when my parents remembered my name. I decided at five that the best way to secure my spot at the dinner table was to be the family writer. I wrote my first play when I was six. The play was a meditation on the complex human interactions of the first Thanksgiving. I called this piece Thanksgiving. This was such a success that I quickly followed it up with a drama about Christmas called Christmas. I believe this play is in the Guinness World Book of Records for Play With the Most Amount of Hellos. From there my career took off. I wrote meditations on the nature of being in high school, was the Editor-in-Chief of my high school paper, created narrative non-fiction for Slice Magazine, wrote short journalism pieces for both print and online publications such as Bust Magazine and Radar Online. An ancestor of mine is said to have been the printer of the Declaration of Independence—he owned a Philadelphia printing press that rivaled Benjamin Franklin’s. In school, my true love left me for a Yale football player and Skull & Bones guy who now, after selling his company to a tech giant, is worth about $350 million. Or maybe that happened to Jay Gatsby; I get lost within the books I’ve read. After college, I worked as a longshoreman on the docks in Oakland, San Pedro, and Shanghai where I was shot at twice, but never bullet-hit. I have a twin sister named Corrine who’s a fierce litigator. I strive to craft tightly-structured stories with unexpected yet earned climactic twists that reveal an aspect of humanity’s beautiful nature. In the last year, I have composed 25 short stories. I also have a novel for middle-grade readers, young adults, and grown people who can keep up with kids. I&apos;m a lifelong train fan, I’ve ridden almost every long distance route in America, some with my son who sharesmy enthusiasm. On a daily basis I ride the NYC subway, and although it’s often crowded and a little dirty, I find it a lovely affirmation when a diverse group of people stand together in an odd sort of jammed peacefulness. So I thought it would be nice to recognize the uniquely intimate train travel of New York City in a poem. Once I wrote it, I asked the New York City Transit Museum if they would like the poem on a postcard to sell in their gift shop, and they said yes. The museum keeps the proceeds. For most of my adult life I have worked in television and written poetry. Along the way, I wrote a book on cable TV published by Putnam and a photography book. Visiting Hours is about regret. I’ve heard a lot of people say something to the effect of, “No regrets, only learning experiences.” I love the idea behind that saying—the idea that everything has a meaning, everything has a purpose, everything happens for a reason. But sometimes, it’s just not possible, at least not for me. When I was a kid, I visited my Grandma all the time. But, as most of us do, I grew up, and as I got older, I visited less and less. I had to work, I had school, I had to live life. Visiting just wasn’t a priority, even though every time I talked to her, that was the one thing she asked, “Come see me, okay?” And I would answer, “Yes, ma’am, I will,” but something always seemed to come up. And then the Alzheimer’s started to take her mind, and it became “uncomfortable” to go see her because she forgot things or got confused. And then she went into the coma. That’s when it got real for me—that’s when I knew time was up. I was too late. I spent hours sitting next to her in hospice, just hoping she would wake up for five seconds so she would know that I was there, that I loved her, that I was sorry I wasn’t better to her. But she never did. It’s been nine years since she passed away, but I still think about her every day. I absolutely regret not going to visit, not spending time with her when she was still her. It’s a learning experience, for sure, but I also hold onto that regret—I feel it every day. 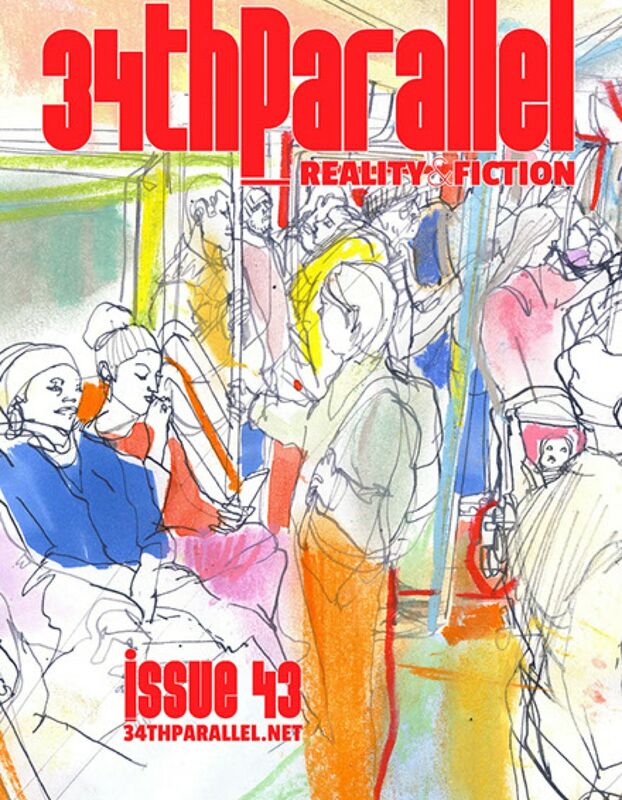 My work has been published in The Auburn Circle (Auburn University) and the 34thParallel Magazine Issue 36. I was born a word-nerd. I’m a lifetime lover of odd words, puns, languages, etymologies, poetry, lyrics, witty scripts, and pithy quotes. At age six I wrote my first story The Wonderful Land of Woodlefodledoodle-lo on pink note paper. In elementary school I answered the question “What do you want to be?” in Dr. Seuss’s Book About Me with “author”. In high school JD Salinger was my literary hero. My greatest and strangest infatuation with words came when I studied Russian in college. I became obsessed with the language. This opened the door to the darkly humorous stories of Gogol and Chekhov, and the more obscure Danil Kharms. I write because if I don’t, I’ll be lost without direction or purpose. I must admit that as with anything you love, there are struggles. I’ve fought hard with myself over writing, not writing, and the fear of writing stiff, cliche mumbo-jumbo. I spend too much time kicking myself over being unproductive. My sister, who also writes, told me to stop reading so much about writing and just write. Simple, sound advice. Writing has become my obsession in recent years. I prefer the detective story, because wrongs can be put right by the sleuth. I love to display different characters and settings. I find that the tropes of detection work for me. Finding out who “done it” surprises me, as I hope it does the reader. I grew up in Rancho Santa Fe, a suburb of San Diego. My father directed movies. I called him a “dancey man”. He was graceful, and had acted in musical comedies before going into film work. I worshiped him. After a failed first marriage, I fell in love with Robert Lehman, then minister of the First Unitarian Church of Orange County in Anaheim. I admired his speeches and his poetry, and he liked my acting and my looks. We discovered that we were in love. We married and moved to Los Alamos, New Mexico, where Bob took the ministry of their Unitarian Society. My two sons, then six and three, went with us. Those were happy times. Churches and ministerial candidates choose each other in a sort of courtship dance. We went to several big-time societies before the Lehmans and the Minneapolis Unitarians finally got together. Minneapolis suited my acting ambitions. That’s where I worked for the famous Firehouse Theater. It’s a good town for theater. We went to San Jose, because I longed to return to California, and because Bob wanted to see if he could influence the Silicon Valley types to take up Humanism. He could. City Lights of San Jose was my baby, my company, and I called it City Lights after the Chaplin film because we occupied a building where the great Charlie had lectured. Then it was good to come back to San Diego. I got jobs at the Rep, and Bob worked for a fellowship in El Cajon. My dear Bob Lehman is dead now. I miss him. Earliest human survival was enhanced by our ancestors’ codependency on their natural surroundings, that is their proper utilization and respect for minerals, vegetation, and animals—the hunter and gatherer mentality. They had a deep spiritual connection to the earth, the natural. I have concerns for future generations, as I believe globalization has not brought with it the respect and consciousness that is needed for the survival of our planet and all living beings. My government (United States) has only been marginally successful and the current leadership does not appear to be mindful enough of the dangers of extinction. The World Conservation Union estimates that 7266 animal species and 8323 plant and lichen species are now at risk of extinction. As a human being/poet who believes all life is valuable from the lessons of our ancestors I am hopeful that we will care enough to live consciously and mindfully, respectful of all forms of life, as Global Dreamers in Coexistence. I am a native Philadelphian, who has published three poetry collections: Images of Being (Stone Garden Publishing 2011), Lights Battered Edge (Anaphora Literary Press 2015), and Night Sweat (Red Dashboard Press 2016). I have been published in The Philadelphia Inquirer, Pennsylvania Literary Journal, Many Mountains Moving, The Indiana Voice Journal, and The New Verse News, among others. My mother and I have this special connection, something preternatural or maybe psychically linked, if I believed in things like that. We frequently discover that we’re experiencing these parallel actions while we are hundreds of miles apart, like reading about Mauritius in the middle of the night, dressing in identical outfits on the same day, being able to know what the other is thinking without context. Sometimes, it’s comforting to be so connected. At other times, it’s too illogical, too mysterious to be a thing of comfort. In this poem, I wanted to linger in that moment of discovery, when once again I am reminded that I’m linked to her in a strange and strong way. I live in Washington, DC, where I have fantastic indie bookstores and a great literary scene to help me develop my writing and explore new ideas. I work in custom-designed fine jewelry, which feeds my passion for art. I have a BA in Creative Writing from Ohio University and an MFA from West Virginia University.